Tried and tested by us here at Vertar, this is simply the softest, deepest pile microfibre finishing polishing cloth we could find. For final polishing off of all waxes, Quick Detailer and even dusting down, you couldn't find a softer, more gentle cloth. It feels like its stolen from a baby ! We safely used it on a supercar collection, including a Bugatti Veyron and Ferrari Enzo so are delighted to recommend it to our customers. 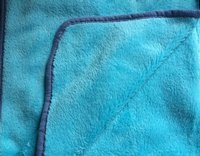 It features a very deep soft pile, like a baby blanket, with soft edge, so will hold dust and product safely. Fully machine washable too.